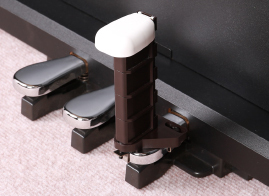 Footrest and pedal with height adjustment functions exclusively for pianos with digital pedals. This stylish and functional product is capable of adjusting along with the growth for your child. For a long time, we have been manufacturing and selling assistance stools and pedals for use exclusively with pianos. Due to the proliferation of digital pianos in recent years, we felt the need for special assistance stools that match well with digital pianos, and we created "Dezipeta" by making use of the experience we gained in developing our assistance series. Why are Assistance Stools Necessary? Small children end up with their feet hanging in the air when playing the piano. This makes their body’s center of gravity unstable and leads to a lack of power and poor posture during their performance. 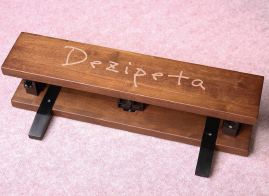 If you use Dezipeta, it will enable your child to perform with proper posture as their feet are on the floor and they can firmly push the pedals. It is also adjustable so that it can match your child’s height. "Understanding Dezipeta in just 2 Minutes"
We gave this a stylish design while preserving functionality in line with modern digital pianos. By providing a wide space on which to place your foot, we make it possible to perform freely due to the firm footing. The pedals on digital pianos come in a wide variety of sizes, shapes and pedal structures depending on the manufacturer and model. Therefore, our digital pedals make use of a configuration that uses a metal fixture to secure the digital pedal to the bottom of the digital piano’s pedal, and this enables them to be compatible with a wide range of pedal shapes. Height can be adjusted with one touch. *Please purchase at your closest musical instrument store. *As all products are handmade, actual products may have slight variations in color tone. *As detailed improvements have been made, please be aware that actual products may slightly differ from the images. A list of our prices. If you wish to request services, please use this as a reference. For questions or consultations, please contact us by telephone or by e-mail form.